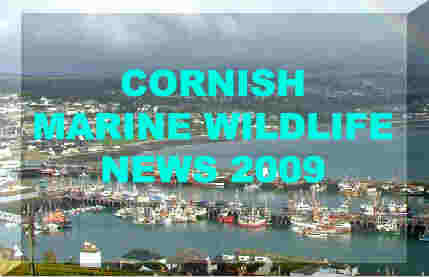 Monthly electronic news bulletin for the marine life of the NE Atlantic Oceans including the seas and seashore around the British Isles. The bulletin is designed for Microsoft Internet Explorer using medium fonts at a resolution of 1024 x 768. Subscribe and unsubscribe options are at the foot of this page. 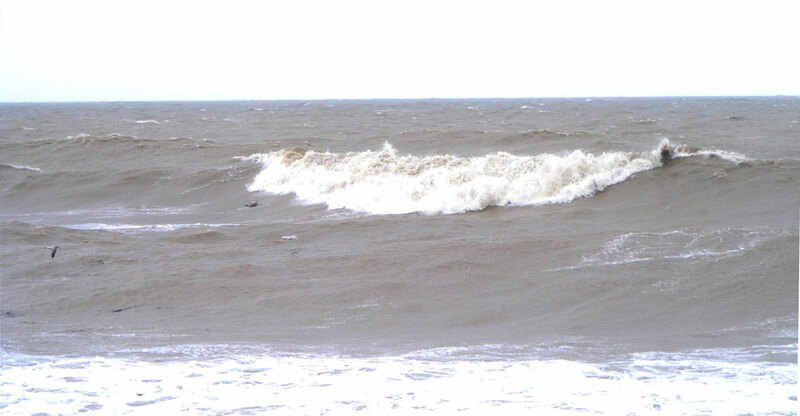 An 18 metre long Fin Whale, Balaenoptera physalis, was washed ashore dead, with a large chunk out of its rear fin, at Lynmouth in north Devon. I discovered two Giant Gobies, Gobius cobitus. at Roskilley, south of Newlyn, Cornwall; in a small middleshore pool, 100 cm x 100 cm (open space), no green algae cover, but there was a very deep crevice under a large rock. On watching them I was amazed at how rapidly they can change colour from dark brown to olive green depending on the bottom / from shade to light. They were both easily teased out their hole with a little mackerel flake. 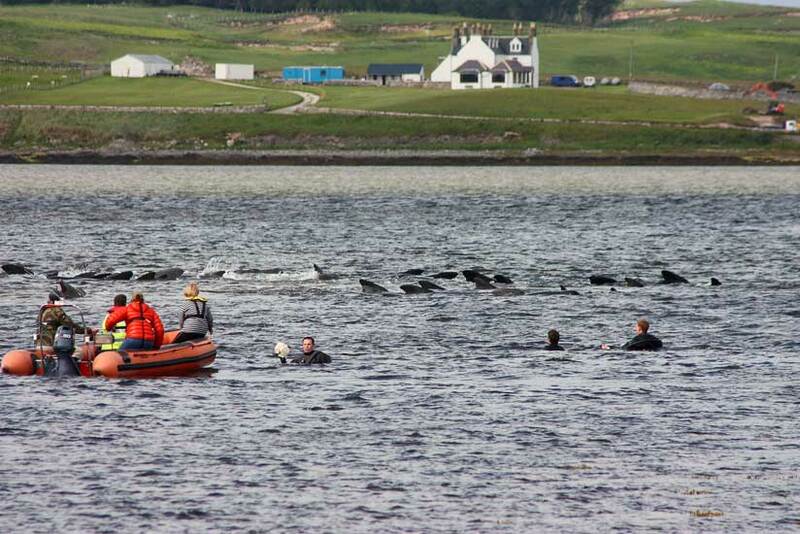 The grim predictions turned out to be accurate as 25 Long-finned Pilot Whales, Globicephala melas, died over night, 15 stranded at low tide on the sandbanks at Kyle of Durness,. A further 44 survived, a few of them successfully rescued by the efforts of the British Divers Marine Life Rescue, rescuers from the Maritime and Coastguard Agency (MCA), Scottish Agricultural College (SAC), Whale and Dolphin Conservation Society (WDCS) and other helpers in this remote location. 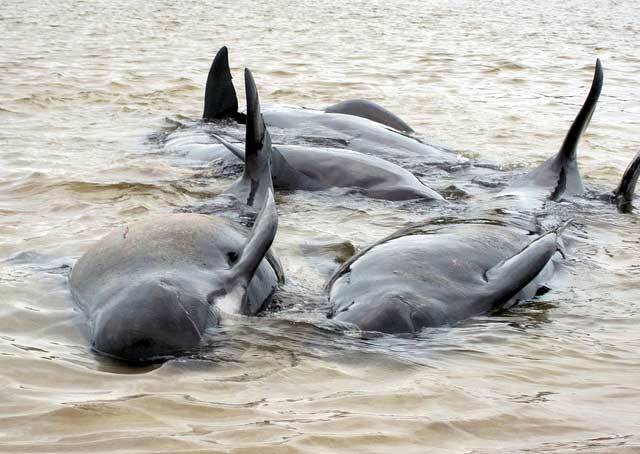 44 of the Pilot Whales successfully swam out to deeper water and away from danger. Update: Three whales, including a calf, had already stranded as the water in the estuary dropped. 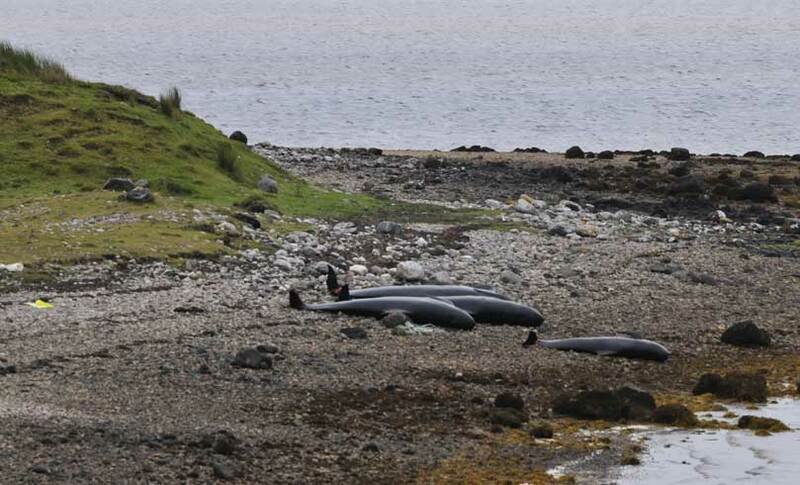 Low Tide Update 8:00 pm: From the original group of whales that entered the Kyle of Durness earlier in the day, thirty stranded live on a sandbank, with two having died. The original four animals that stranded earlier were still being cared for by trained medics and around twenty animals were still in the shallow water. Several Bluefin Tuna, Thunnus thynnus, were spotted and at least one was captured off the Dorset coast. Young rockpooler Henry Hyndman discovered a small colony of breeding Cushion Stars, Asterina, in a rockpool on Fair Isle (midway between the Shetland Isles and the Orkney Isles). This was a newsworthy discovery because this is a southern species usually found off the coast of Cornwall and south Wales. A Sei Whale, Balaenoptera borealis, was spotted and photographer by Danny Kerr in the Air Ambulance between Islay and Gigha in south-west Scotland. This deep water whale is rarely seen in the shallower seas around the British Isles. For the second successive year a Sperm Whale, Physeter macrocephalus, was spotted off the south coast of Devon near Brixham. The giant fossilised jaws of a Pliosaur went on display at the County Museum, Dorchester. The 2.4 metre long skull was discovered on the nearby Jurassic Coast at Weymouth Bay. It is 95% complete as a result of a careful recovery by amateur collector Kevan Sheehan. This Wall is now working properly and members can now post on it. This is designed for quick less important chatty news items. Photographs can be uploaded quickly which is only possible on the Yahoo Group by going to the web page. Images can be uploaded to flickr. to other observers or reporters. Each month, at least one special marine image will be published from images sent to the BMLSS. This can be of the seashore, undersea world or any aspect of the marine natural world, especially the underwater life, but not restricted to life beneath the waves. Topical inclusions may be included instead of the most meritorious, and images will be limited to the NE Atlantic Ocean and adjoining seas, marine and seashore species and land and seascapes. Lepadogaster lepadogaster (Bonnaterre, 1788) Shore Clingfish, Cornish Sucker. Lepadogaster lepadogaster purpurea is the area (British) subspecies. The Shore Clingfish or Cornish Sucker, is a southern species found on the shores of the Mediterranean and Atlantic coast of Europe reaching its most northerly point of distribution on the south-west coast of England, Ireland and Wales, recorded from Dorset and south-west Scotland but absent (or extremely rare) from the coast of Sussex and North Sea shores. It is found in shallow water where it lives under rocks and can occasionally be discovered on the low spring tides. The pelvic fins of this fish are modified into a sucker to cling to rocks and avoid it being dislodged in rough weather when it is guarding its golden yellow eggs. 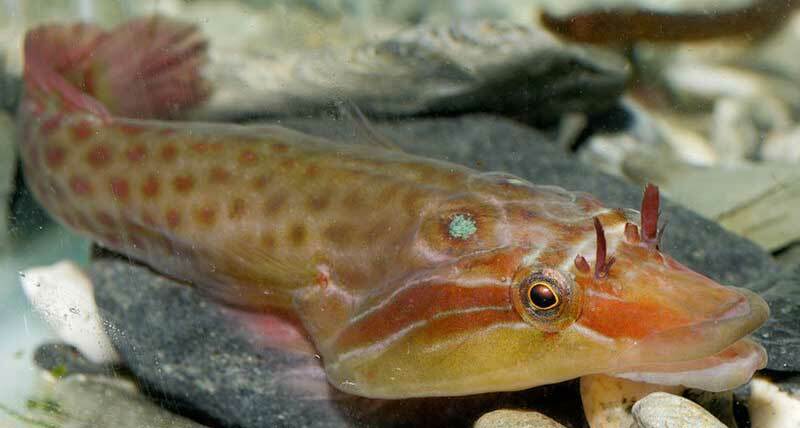 This fish is very similar to the Connemara Clingfish, Lepadogaster candollei Risso, 1810 but can be distinguished from it by the two fringed flaps by each nostril which are clearly visible (Frances Dipper). The name of the particular coast should be included and any other interesting information including the grid reference, if known. Print photographs can be included in Exhibitions and on the BMLSS Web Sites and electronic publications. Electronic images in *.jpg format can also be considered for the web site. They should not exceed 350K in size. Dramatic geology of a sea cave on the uninhabited island of Staffa. Argyll, Scotland. 50 to 60 million years ago, during the Paleogene period (Lower Tertiary), the area was subject to intense volcanic activity, when highly fluid molten basalt intruded through chalk beds to form an extensive lava plateau. 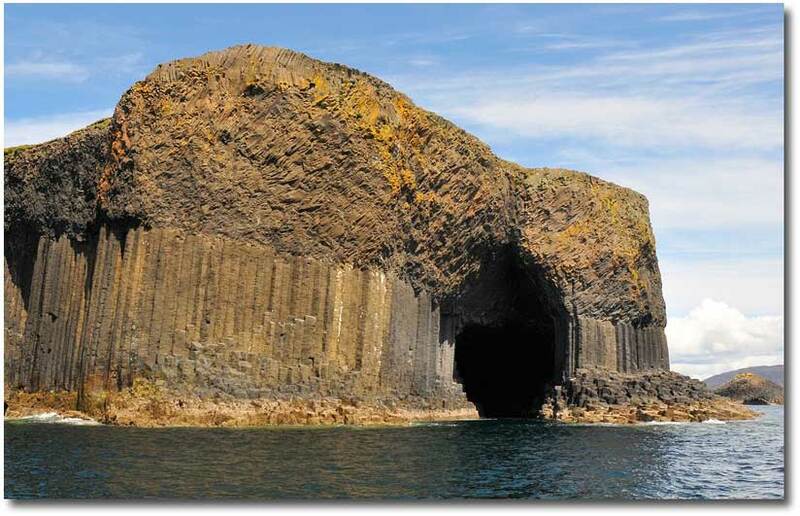 It is formed entirely from hexagonally jointed basalt columns, similar in structure to (and part of the same ancient lava flow as) the Giant's Causeway in Northern Ireland and those of nearby Ulva. In both cases, the cooling surface of the mass of hot lava cracked in a hexagonal pattern in a similar way to drying mud cracking as it shrinks, and these cracks gradually extended down into the mass of lava as it cooled and shrank to form the mostly vertical columns, which were subsequently exposed by erosion. It became known as Fingal's Cave after the eponymous hero of an epic poem by 18th-century Scots poet-historian James Macpherson. The legend has Fionn or Finn building the causeway between Ireland and Scotland. The cave's Gaelic name, Uamh-Binn, means "cave of melody". As Staffa is a small island out at sea, its wildlife population is dominated by seabirds. A large colony of Puffins breed on Staffa every summer and are always a firm favourite with visitors who can see them congregate on the cliffs, diving into the water then return with a beakful of fish. The best time to see the Puffins is during the breeding season between the start of May and start of August when the birds have their distinctive colourful beaks. Other seabirds that either nest or feed from the island include Gannets, Guillemots, Razorbills, Great Northern Divers, Fulmars and Great Skuas. In addition to Staffa’s rich seabird life, there is of course plenty of wildlife beneath the waves. On a trip to Staffa there are very often sightings of spectacular cetaceans such as Dolphins, Porpoises and in the summer months: Minke and Fin Whales. The warmer months also see the return of the mysterious and elusive Basking Shark whose massive fins are seen breaking the surface as it feeds. Photographers submitting pictures should indicate if they wish them to be considered for inclusion as confirming permission takes work and time and can delay publication of the news bulletins. In chronological order, the most recent events are at the top of the page. Events open to the public, free or for a nominal charge only are included. Most Seminars need to be booked in advance.
? What to do if you find a stranded whale or dolphin ? If you find a LIVE stranded or injured whale or dolphin on the beach you must send for help QUICKLY. 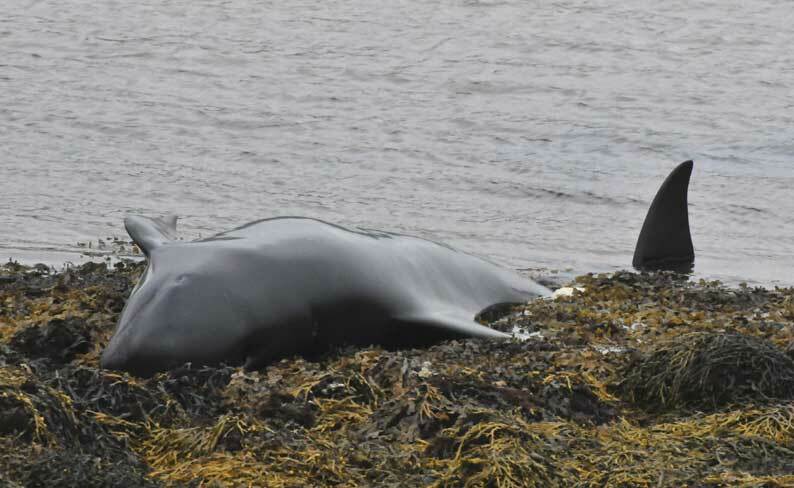 A whale or dolphin stranding is an emergency and the speed of response by a professional rescue team is perhaps the most crucial factor in determining whether or not an animal can be returned to the sea alive. 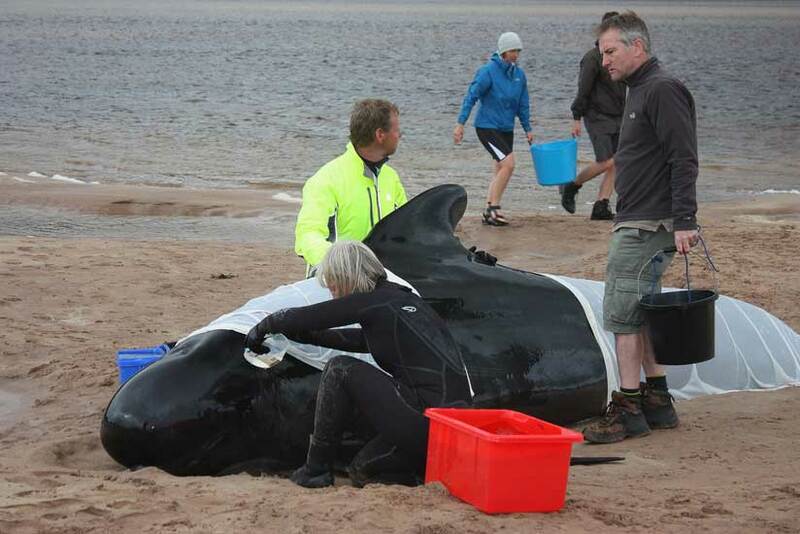 Would you know what to do if you found a whale stranded on a beach? 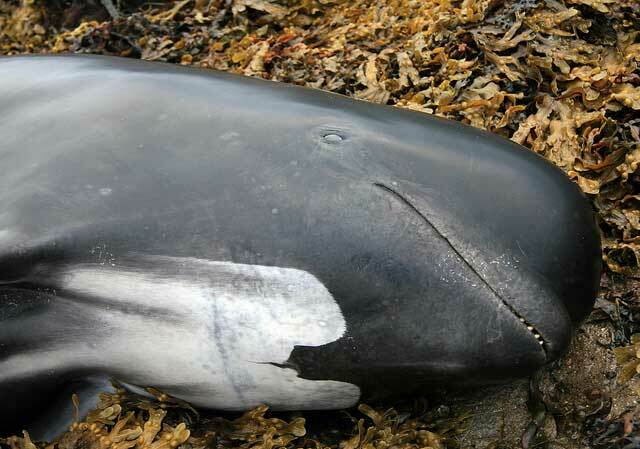 Each year anywhere between five and 50 whales, dolphins and porpoises are washed up on Britain's beaches. 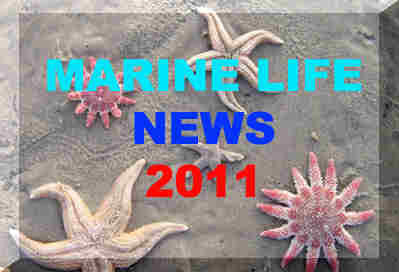 British Divers Marine Life Rescue, a volunteer charity, was set up in 1998 to rescue them. 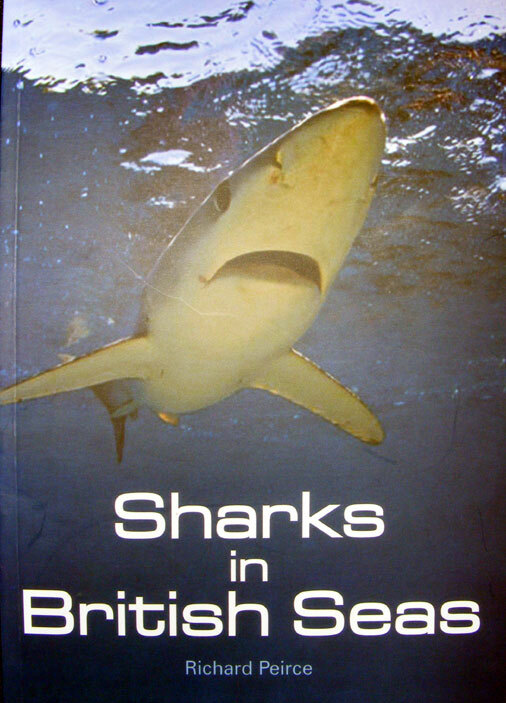 With 256 pages and numerous photographs supported by drawings, this book is the most comprehensive photographic guide to marine fish currently available in the UK. 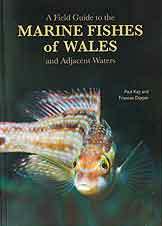 Published for the Marine Conservation Society with support from the Countryside Council for Wales. 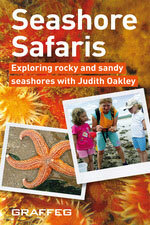 PS: A second revised edition of the book has been published. 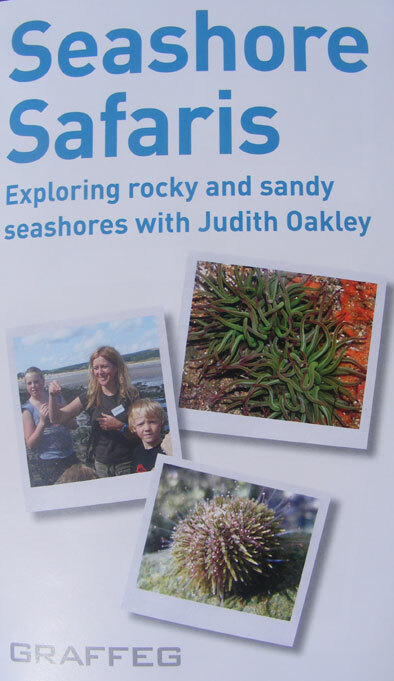 This is the book I should have written (and I dare say a few others as well) and is a much needed introduction to the world of the seashore and the hobby of rockpooling. It is a photographic guide to most of the common species encountered which is much appreciated as newcomers and even experienced rockpoolers will try and match up what they have seen to a visual image (and photographs work better than line drawings) and this will usually get them the correct species, (unless there are two very alike species and then you will need a specialist identification guide like the Collins Guide to the Seashore). 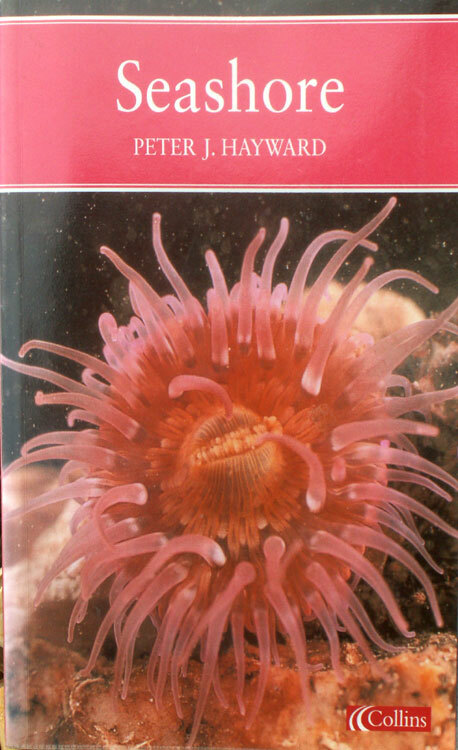 However, the seashore is a rich and interesting habitat with a myriad of species and 225 pages of this large pocket guide are comprehensively covered to suit the enthusiast. "Being able to names to what you see and, better still, to use your observations to add to our knowledge about the natural world is what this book is about." 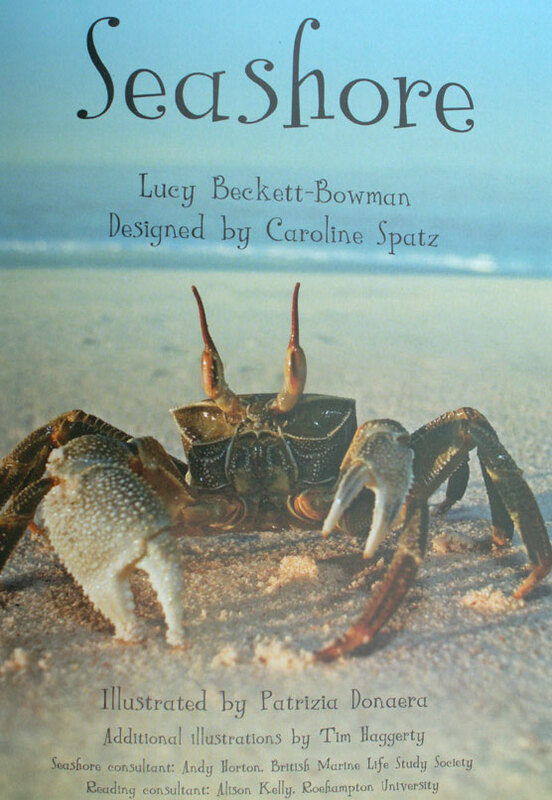 explains about the tides (very briefly: a detailed explanation can be in chapter 2) and the equipment you may need, where and how to look for the seashore critters (my term). The large animal life section is structured roughly by phyla (major groups of animals) ignoring for the most part the specialist microscopic studies. Each animal group is given a brief description including behavioural characteristics. Each animal is given a common name and the important scientific name (because the common names can vary in different localities and in different books) with a photograph, brief written description, habitat preferences and field notes. Male crabs have a narrow 'v' shaped tail with 5 joints and in females the tail is wider with 7 joints." Fish are the most interesting discoveries for many of the fledgling rockpoolers. 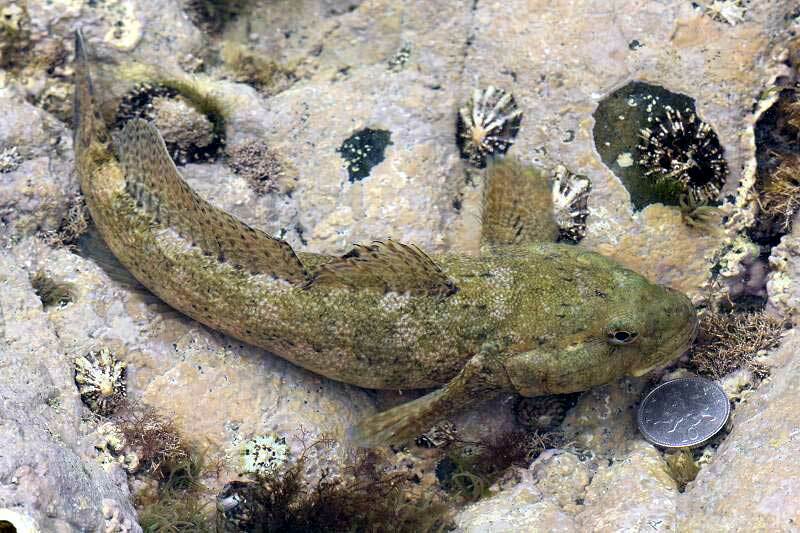 Most of the common species are included but a frequently encountered species like the Rock Goby, Gobius paganellus, has been omitted. In contrast to the fish the common macroalgae are well covered. This is a good section encouraging participants to take an active interest, how the public can help and a comprehensive list of where to report their findings. 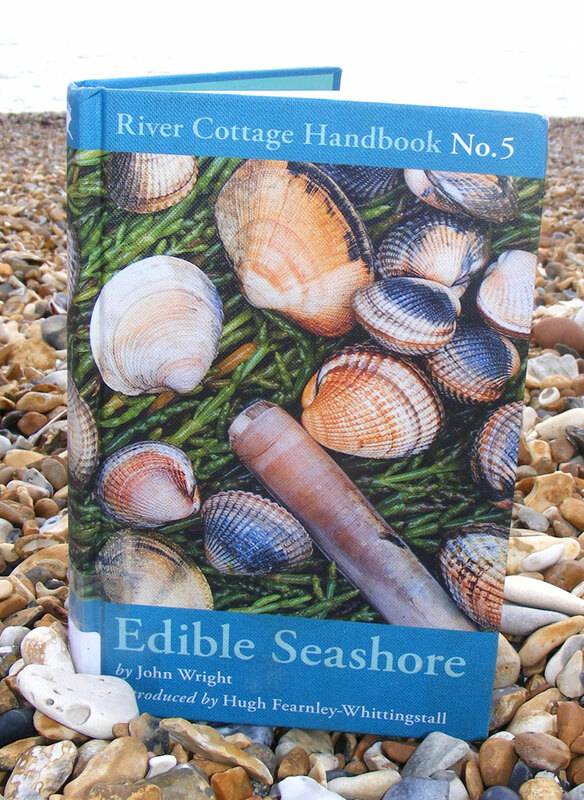 With a book list and a list of organisations and their web pages, a comprehensive glossary and an index, this has the hook that could result in a lifetime interest in the seashore. Now why would anybody want to go to Serengeti when we have so much of interest nearer to home? Starting Out: Conservation and Equipment, including the first paper published instructions on how to construct a shrimp net (push-net). 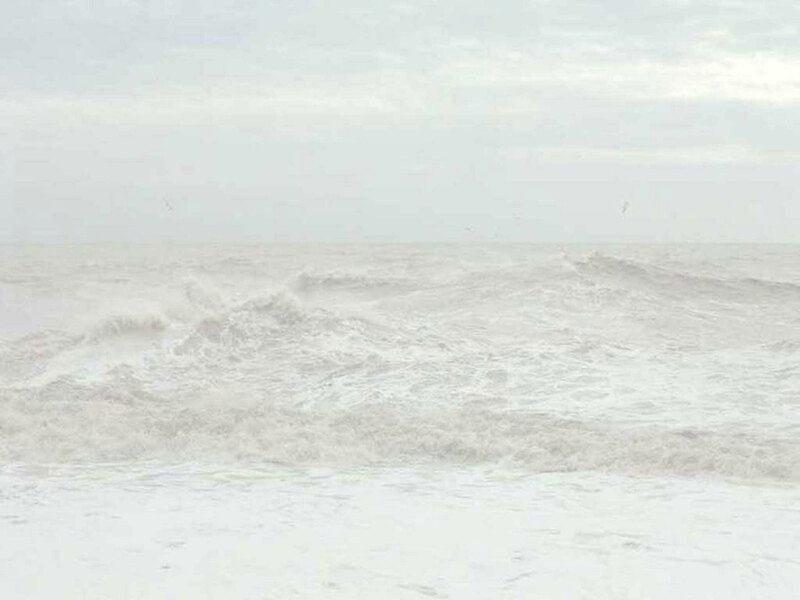 Foraging: Lots of useful and essential information about the tides, weather, safety and what to wear. Rule Book: This is the bravest inclusion. John Wright attempts (better than anyone so far) to explain the rules, law and ethics of seashore collection, what you are allowed and not allowed to do. It is worth buying the book for this chapter alone. All the expected species and some unlikely edible candidates are included and each is given two pages. Very informative and lots of information I did not already know. 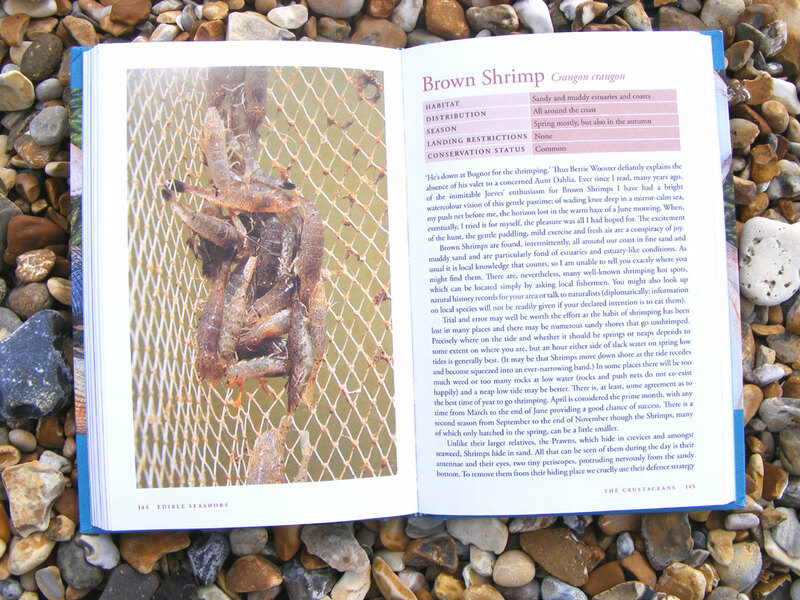 John Wright conducted his research first hand and we shrimped together on Southwick Beach with Peter Talbot-Elsden (as shown in my photograph, not in the book). The Recipes: Well I would omit the chilli in the Potted Shrimp. After collecting the food, I am usually a wee bit tired and this chapter should be for your partner. Let me know how you get on? 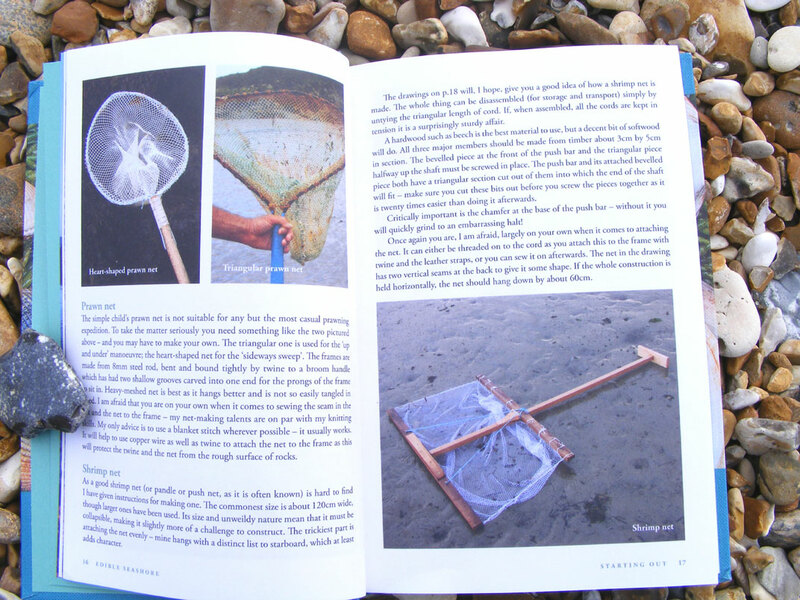 The home-made shrimp net on page 17 is an identical design to mine, the one used by John Wright before he made his own on our expeditions at Southwick, and the one used by Charlie Dimmick on River Walks filmed on nearby Lancing beach. Conclusion: Highly recommended, essential purchase ***** (highest five star rating). Up to date with all the latest happenings at our Purbeck Marine Wildlife Reserve in Kimmeridge. Philip Henry Gosse was a popular naturalist who moved to Victorian Ilfracombe and wrote his natural science book ‘A Naturalist’s Rambles on the Devonshire Coast’. He later designed the first public aquarium, which opened in London. His activities also attracted other naturalists, including Charles Darwin and novelist George Eliot. This book celebrates the link between Philip Henry Gosse and his rockpool adventures in Devon and contains lots of information about the life of this self-taught Victorian scientist and writer. in conjunction with an Exhibition that finished on 25 April 2009. 138 pages, colour illustrations, line drawings, colour & b/w photos. 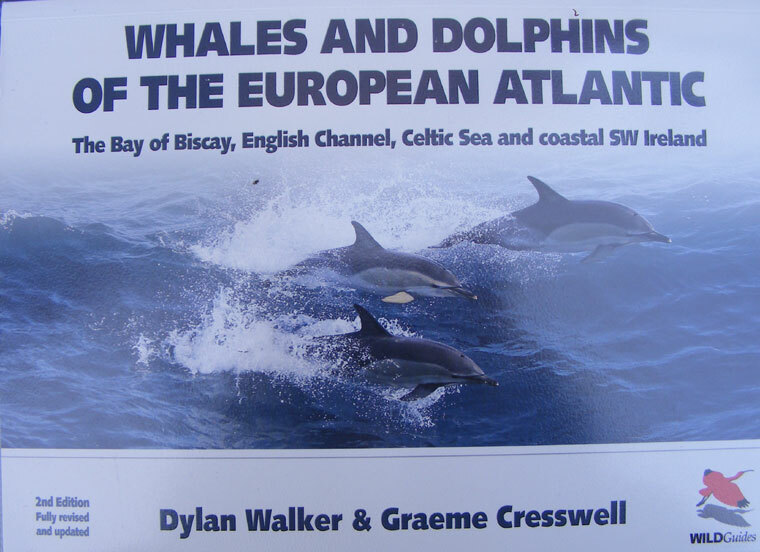 This is the second fully revised and updated edition of this comprehensive guide to the identification of whales, dolphins and porpoises (collectively known as cetaceans) in the European Atlantic. Until very recently, most researchers and whale-watchers were unaware of the great variety of cetaceans that can be seen so close to the shores of western Europe. Indeed, it is only during the last decade, when detailed cetacean surveys have been carried out in earnest, that we have discovered how important this area is for cetacean biodiversity. This field guide describes all of the 31 species of whale, dolphin and porpoise that have occurred in the European Atlantic. 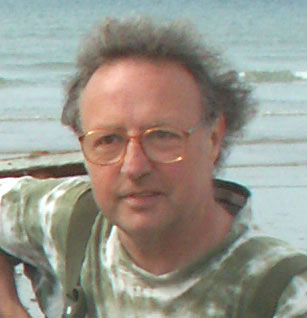 Amid contemporary scenarios of potential climatic catastrophes and global warming that might be imagined to bring a new ice age, the powerful image of the Gulf Stream rising from the Florida Straits and flowing to the north Atlantic inevitably provokes questions about its ecological significance and whether it might ever stop. Paperback. Pp 288. Colour & b/w photographs, illustrations, charts, maps and bibliography. Fine copy. "New Naturalist" Seashore is a comprehensive, authoritative account of the natural history of the seashore. 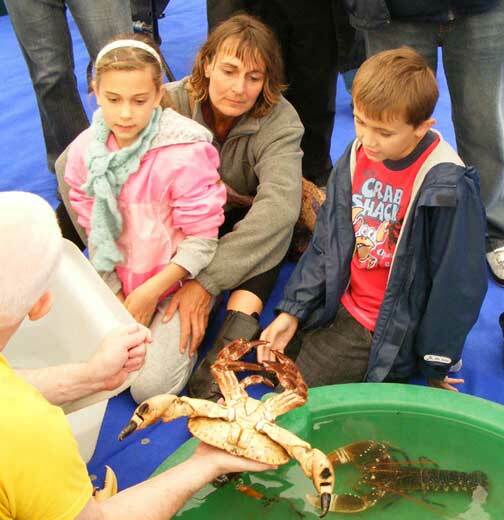 The British Marine Life Study Society are responsible for producing the journal GLAUCUS, which is the first publication exploring the marine life of the seas surrounding the British Isles available to the general public. In future, I expect the publication to be in an electronic format. the TORPEDO Electronic News Bulletin. The Glaucus 2002 CD-ROM was sent out to Premier BMLSS members in January 2003. Plans have not yet been finalised for the publications and subscriptions for year 2011. Back copies of previous issues are still available. 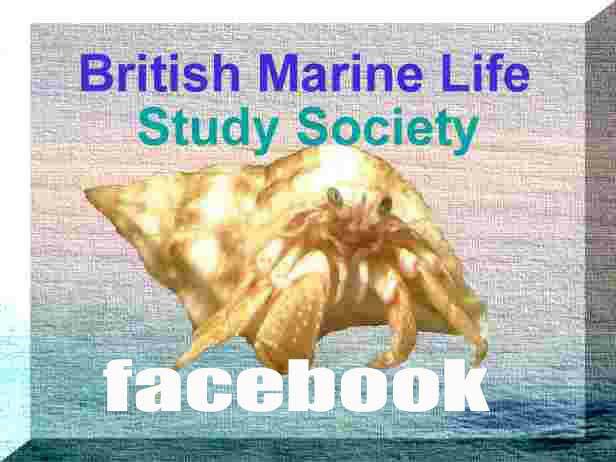 If you receive this Bulletin direct from the British Marine Life Study Society it will contain only hypertext and image (*.htm *.gif & *.jpg) files. Recipients can only unsubscribe if the Bulletin is received directly from the BMLSS. Permission is granted to forward the Bulletin on unaltered. However, you will have to include the images separately. To save download times, only new images are included with each Bulletin. The Bulletin is designed to be viewed on Internet Explorer using medium fonts at a resolution of 1024 x 768. Viewing should be possible on Mozilla and other browsers. These pages are not designed for the default settings on the Page Set-ups of your browser. I recommend viewing in Microscope Internet Explorer 7 and altering the right and left hand columns in the Page Set-up menu to 9 mm (from 19 mm). The page set-up can also be amended in Netscape Composer and other web page editors, and this has the advantage of enabling the specified number of pages to be printed and the information about the file (name, path, date) to be deleted. Some of the images may not display if you have changed your directory for downloaded files. The images may also not display properly if your settings on your EMail software do not allow you do this automatically. When received in Pegasus the format is changed slightly, but the bulletin is still readable.